Abby the Librarian: Book Review: When Is a Planet Not a Planet? But did you know that Pluto's not the first planet to be demoted? I had no idea. Elaine Scott has given us a great look into the history of the discovery of our planets. This book includes much more than the story of Pluto. It starts in Ancient Greece and takes us up through the present day, giving a complete picture of how astronomy developed. The origin of the word "planet", the invention of the telescope, the difference between the small rocky planets and the gas giants... these are all covered in this book and all the information plays into why Pluto was ultimately demoted. It's written in a clear, concise manner with many photos of actual planets and drawings of what we think space objects might look like. 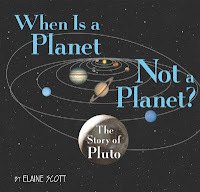 Although the book is definitely written for a child audience, I daresay adults wanting an explanation of the Pluto situation might find this book helpful. It provides enough background information that you really understand what happened and why without going into so much detail that it bogs down the reader. Scott includes a glossary, a list of books and websites for further reading, and an index. This is a great book for upper elementary kids wondering just what happened to Pluto. Happy Nonfiction Monday! Be sure and check out all the links over at Picture Book of the Day! We must be on the same wavelength. Today I reviewed The Planet Hunter, a book about the astronomer whose discoveries led to Pluto's demotion! Thanks for the review. I'll definitely look for this one.